It was great to meet somebody as passionate about pies as we are here at Pierate. And not just pies - but proper pies. None of that mashed potato or pastry-topped casserole rubbish. Proper, hearty pies. I'd popped down to Clapham to meet Chris Brumby, recently crowned king of the sausage roll, for a chat about all that is pastry. In January, Chris triumphed at the Red Lion Barnes Great Sausage Roll Off 2014, but it's good to see that Chris' heart seems more set on pies than sausage rolls. We don't want a pastry connoisseur defecting to the dark side. So what's the end result of all this passion and pie pressing? It's this: a beef and red wine pie. It has rosemary-lined shortcrust pastry on the base, and is topped off with a puff pastry lid sprinkled with cracked black pepper. And what's more, this attractive little gem is pretty weighty too. The first thing to note at this stage though is the boil-out on the lid, leading to a small patch of burn that affects the pie's appearance. This would lose marks at the British Pie Awards, and we also mark this down under the category of Condition. This boil-out might just be a one-off, but I have to rate the pie in front of me. Also, if you look on the left-hand side of the picture at the interface of the side and lid, you'll note that the two sections of pastry have broken away from each other. It's not a major issue, but it is an issue that affects the pie's appearance and structural integrity, especially when cut open. I put this down to the pastry being a little thin. So we've seen how great the pie looks on the outside, and on the inside, but how does it taste? Yep, pretty great too. The filling is quite rich, and you can certainly taste red wine. This perhaps isn't a pie for anyone not a fan of red wine, but I think it's rather delicious. I don't think I've ever described a pie as "full bodied" before, but now might be an appropriate use of the term. There is a good mix of vegetables within the pie, and you can see the individual ingredients including the carrot and the onion. The beef is a delicious and obviously of high quality - it melts in the mouth and is not at all chewy. The filling is nice and moist, with no need for additional gravy. You could happily eat this pie as an independent item, with no need for external vegetables or gravy. In that sense, the thinness of the pastry works quite well, since it almost dissolves away as you eat the pie, meaning you don't need any gravy to moisten it and soften it. The content is also lovely and herby, and you can taste the rosemary that lines the shortcrust base. All in all, I'd certainly recommend this pie. The main query I have with this pie is the thickness of the pastry, which seems thinner than I am used to. This has its upsides and its downsides, but ultimately I think this will be an issue of personal preference. The thinness of the pastry means the pie has less structural integrity, but then again it does actually make the pie easier to eat. The filling is moist, delicious and doesn't hold back. I look forward to seeing how Chris moves forward with these pies in the future. continue reading "Have Some Beef and Red Wine and All Will Be Fine"
With many accolades to their name, we wanted to check out Fuud and give them some food for thought. 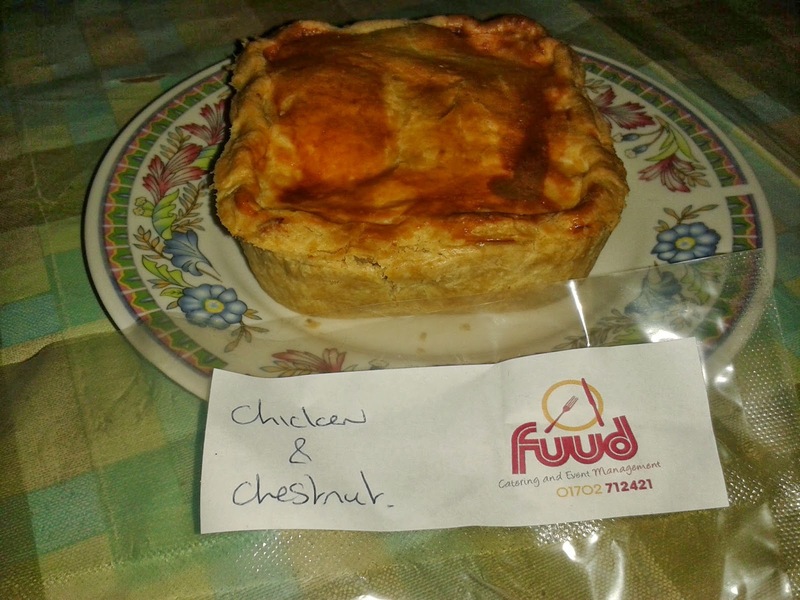 They entered the British Pie Awards 2013 and won the Chicken Pie category with the Chicken and Chestnut pie, so we were looking forward to rating their pies. 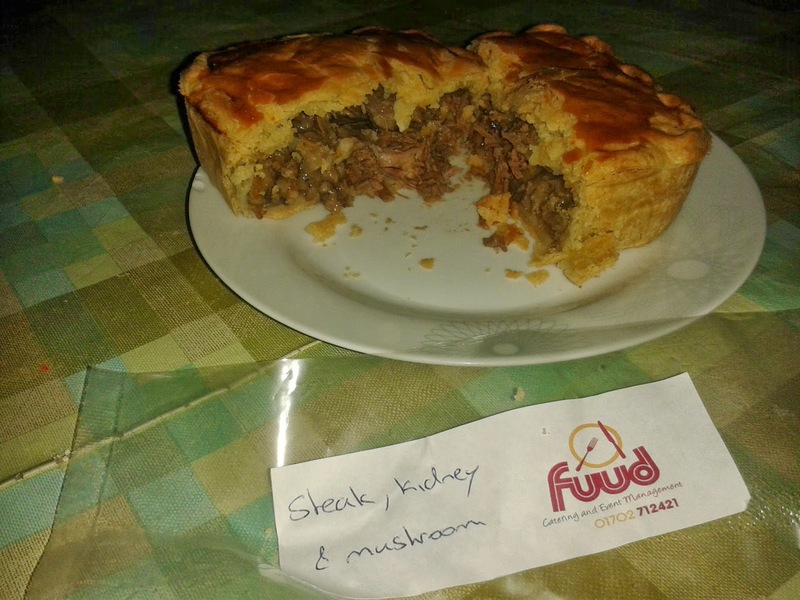 Fuud are primarily outside caterers and would sell their pies for £3.50. We were given three pies to rate when we were in Southend-on-Sea recently. 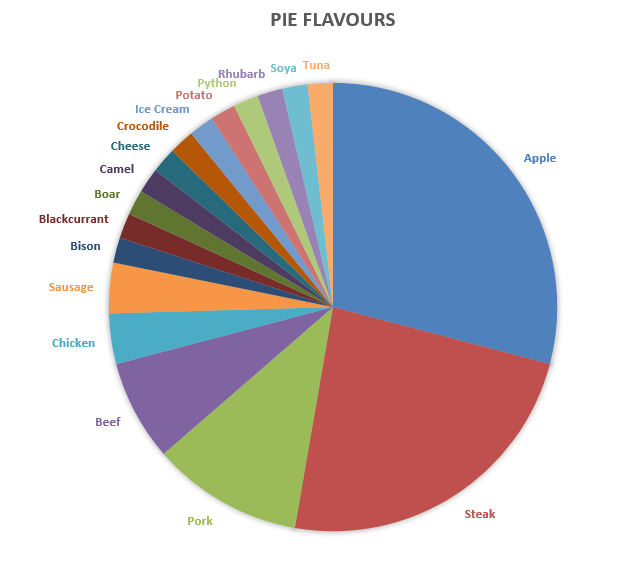 Before I go into detail about each flavour, a brief overview of the pies in general. The pies were all square in shape and fully encased in pastry (as they have to be to compete in the British Pie Awards). These square pies are quite compact but they sure are packed with filling! There was no doubting the top capacity in these pies! The pies are fairly deep and filling, so at £3.50 for a pie these were quite good value. The pastry of the pies was varied. In general the lid was crisp, flaky and had a bit of a softer underside to it, which I really enjoyed. However the sides and base were a bit too dry for me. While holding the pie together well and being fine to begin with, it did get a bit too dry particularly around the corners of the pie, where the pastry:filling ratio is even more skewed towards the pastry. It was good to know these pies could be picked up and eaten by hand, as a proper pie should be able to, but a slightly moister pie pastry would be preferred. The Chicken was lovely and tender and moist, while the chestnut sauce did add a slightly distinct flavour to the chicken. However I’m not sure I would have been able to pick out in a blind taste test that this pie contained chestnut – though I’m not sure what flavour I would have put down for the sauce. Being aware that this pie was “Chicken and Chestnut” I was also surprised not to have a bit of crunch within the pie, as it was just chicken and the sauce. The sauce wasn’t at all runny but did smother the chicken and the content was very consistent all the way through. A slightly runnier sauce might have added a bit more moisture to the pie and complimented the pastry better. 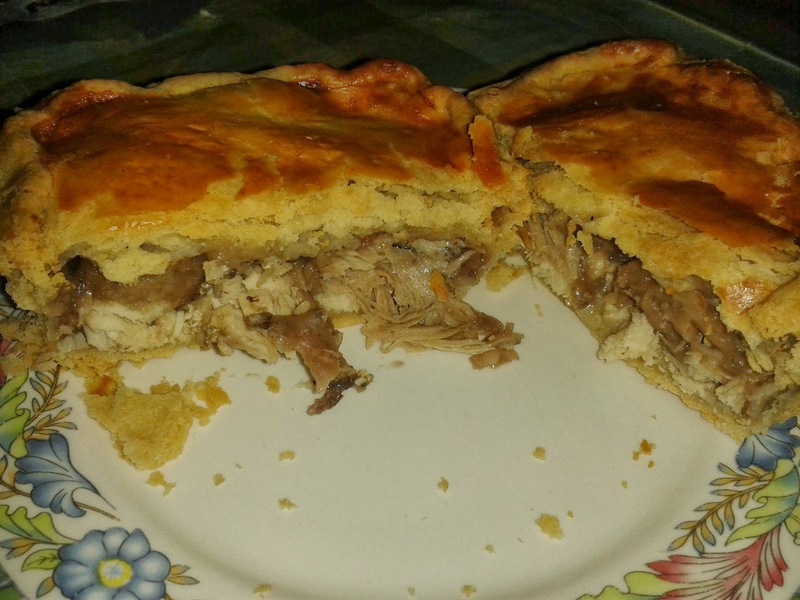 The filling was therefore very nice and a distinct flavour but the dryness of the pastry did detract from this pie and stop it achieving top marks. In a smaller pie like this, where there is a higher pastry:filling ratio, I would happily eat another but not rush back for more. Cooked in a delicious gravy with a packed capacity, the steak and kidney pie was my favourite filling of the three pies. 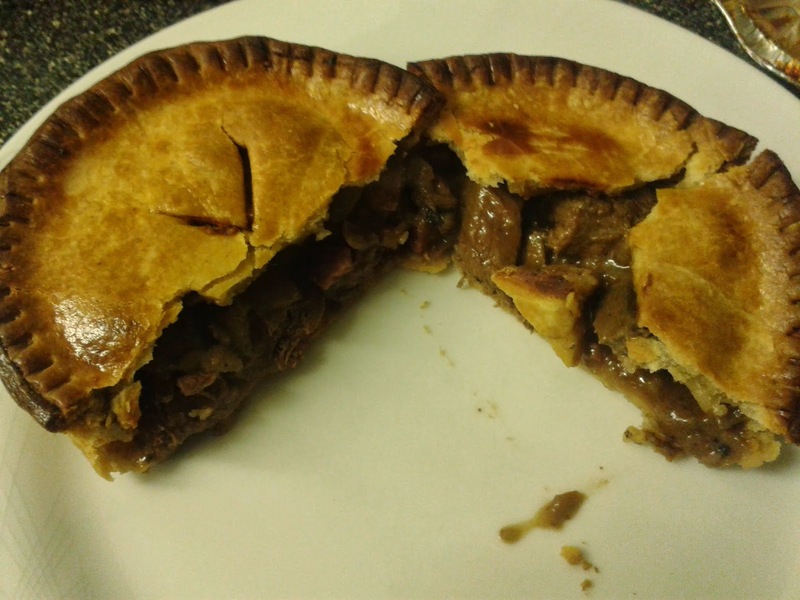 The meat was lovely and tender and there was a good steak bias to the pie content, amid a well-balanced pie flavour. The content was lovely and moist, though it could have still had a bit more gravy ideally. Again the outside pastry was a bit dry but the meaty content more than made up for this and had a great balance of flavours. Unfortunately the mix of meat and sweet didn’t work for me in this pie. While I understand that some people enjoy the mix of pork and apple sauce for their roast dinner, for me the ratio of meat and sweet plum flavour was imbalanced. The pork itself was lovely and tender, with good quality meat, however the flavour of the sweet plum sauce detracted from the meat too much for me. There was certainly quite a bit of moisture in the content, which partly balanced out the drier pastry shell but didn’t take away from the overly sweet flavour. While this pie may appeal to those who like a sweet and meat mix, it wasn’t for me. These pies from Fuud certainly give you some food for thought. You can tell they are a good quality of pie, packed with quality, tender meat. Despite some slightly dry pastry holding it back from being a top rated pie in my opinion, the chicken and steak pies were very good content. 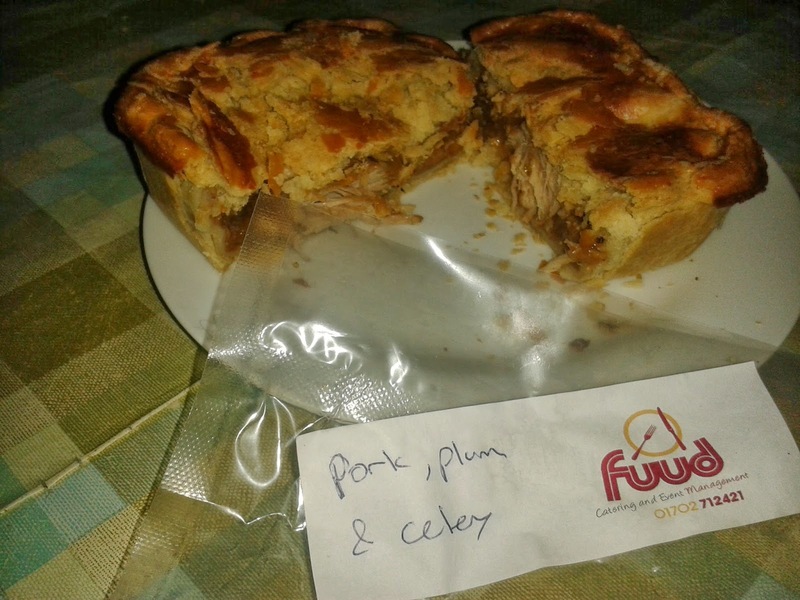 While the pork and plum pie was an interesting food combination, it didn’t work for me, but in general the Fuud pies are worth getting your hands on and we're glad we did in British Pie Week 2014, including a Pierate Recommended and Pierate Highly Recommended pie. continue reading "Fuud for Thought - Fuud Pie Reviews"
It’s a hard question to answer. We’ve eaten quite a few unusual pies over the years – and many of them were unusual for more than just their filling. So here at Pierate HQ we put our heads together and drew up a conclusive list of the Top 12 most unusual pies we’ve ever eaten. After eating these pies, RAS concluded that "if I were to buy them again, it would certainly be for the "Three Kings" novelty factor rather than the edibility factor". These extravagant delights from Fortnum & Mason make it into the list of unusual pies for two main reasons. The first reason is obvious. Gold? Frankincense? Myrrh? Can you really eat those things? Well yes, yes you can. But Pierateer RAS complained of a lack of filling and fruitiness in the gold topped pie, and noted that the frankincense oil-infused pie felt "slightly like eating some minty toothpaste in a pie". The second reason is their eye-watering price tag. At £12.95 for a dozen, these aren't mince pies you're just going to be sipping with Sainsbury's Basics lager - although that might be all you can afford after splashing out on these expensive treats. But we certainly commend RAS for taking it for the team and forking out the money. 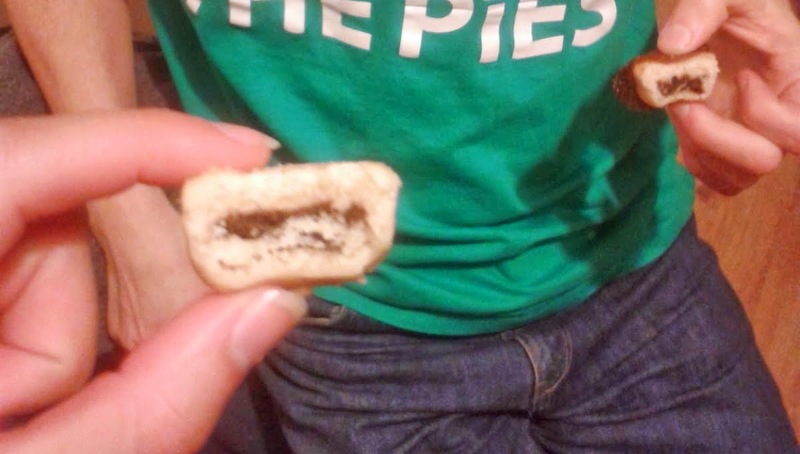 Ever seen a smaller mince pie? My Vietnamese friend looks at this picture and says: "Oh I know this one. It's coconut pie." "Is it common?" I ask. "Yes. It's not exactly traditional, but whatever pastry we've got we tend to stuff it with coconut." Well there you go. An interesting cultural lesson from Pierate. 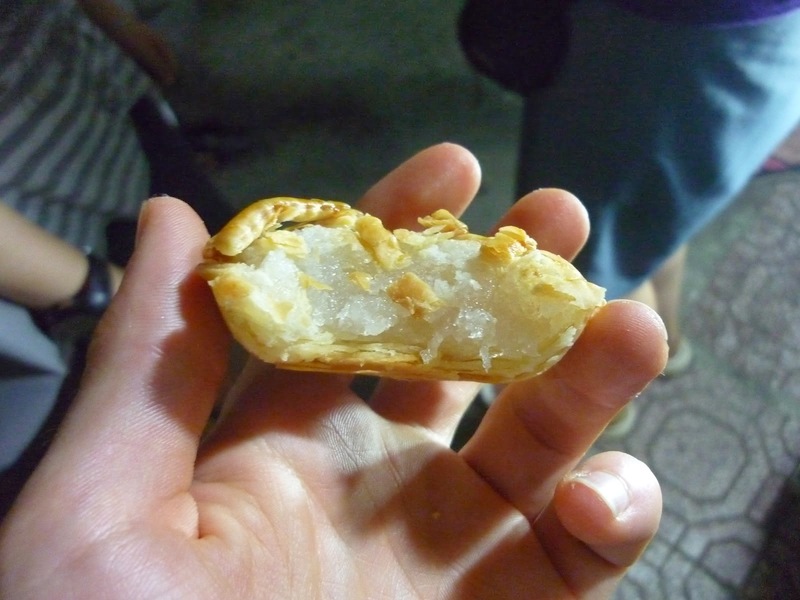 SJL bagged this lattice pie from a dessert stall in the Vietnamese border town of Chau Doc, near the Mekong river. Commenting that "the flavour was about as confusing as the politics of Vietnam", SJL wasn't quite sure what to make of a pie that "looked like coconut but actually tasted like crystallised sugar but wasn't overly sweet" and "had a kinda starchy taste which reminded me of rice." Aren't we missing something here? We ate this chicken pie at the same time we ate an ostrich pie, so why would the chicken pie make the list and the ostrich pie not? The answer is that the Hong Kong chicken pie was, oddly, far weirder than the ostrich pie. The juxtaposition of the chicken pie's savoury filling with the sweet pastry played havoc with SJL's taste buds. Describing the experience as "a bit of a culture shock for me", he had to overcome the weirdness by eating the filling first and the pastry second (for dessert). Very unusual. The ostrich pie, on the other hand, apparently tasted great. From the picture you can see this isn't a real pie - it's a casserole with a lid on top. But what makes this pie weird is its name. The Hoops Pub call it the 'Polabe Pie'. "What is a polabe?" we asked ourselves. Is it some kind of exotic vegetable? Is it type of deer? Or a species of pigeon? And how do you pronounce it? Poe-lay-be? Poll-labe? It turns out polabe is more simply just a contraction of "pork, lamb and beef". While it's not a particular crazy filling in itself, it's certainly an unusual name for a pie. Pierateer RAS received the shock of his life when ordering an apple pie in an Amsterdam McDonald's. 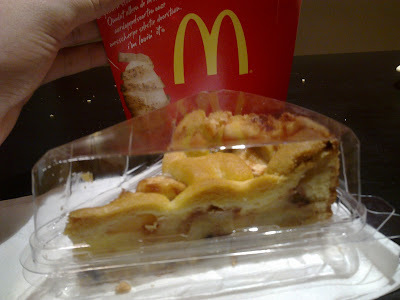 Yes, when the Dutch wish to procure an McDonald's apple pie, they are served an actual apple pie! What in blue blazes?! It even comes in a plastic casing. But it leads us to ask: why don't British McDonald's customers receive the same treatment? Borneo Pie Tour was never going to be a huge success, but one thing we did learn is that you can buy a pie in Starbucks. Yes, a real pie - not even a little apple tart or anything. A full-on beef and onion pie. It all seems quite bizarre: why can you buy a pie in a Borneo Starbucks, but not in a Starbucks on British soil, arguably the home of the pie? These ships of the desert can travel great distances across arid terrain and forego water for days on end. While impressive, these facts don't necessarily translate into something that sounds tasty to eat. But boy was I wrong. The slow-cooked camel was tender as anything, and rather delicious too. Oddly enough, we've actually tried zebra pie twice here at Pierate. 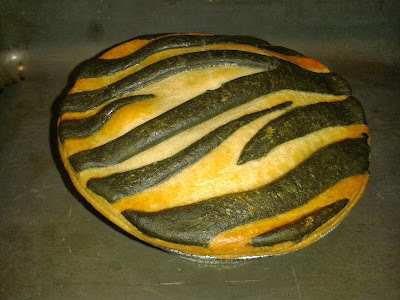 Once when we made our own zebra pie (and horse pie), and a second time when we tried the Nice Pie zebra pie (in the photograph). We all agreed that our own creation was, if we may say so ourselves, really rather good. The zebra meat was a lot more tender than its horsey counterpart, with a texture likened to pork. Equally delicious was the Nice Pie version, which came sporting some very impressive stripes. This pie was therefore unusual both in terms of its content and design! We are really entering unusual pie territory now. I mean, who in their right frame of mind would consider putting that into a pie? What were they thinking? LEEK?! Oh ho ho, I'm just joshing. Of course the unusual element to this pie is the snappy aquatic reptile. If you watch the video, you'll see that SJL (who ate this pie as part of a week-long pie-eating marathon) actually very much enjoyed the crocodile. So bravo Nice Pie on another successful and unusual concoction. “Squirrel – really? !” Yes – really! We're hoping these are grey squirrels, and not those lovely red squirrels. Our main question was: how much meat can there be on a squirrel? Well, RAS went nuts for this pie, so squirrel meat must be pretty good. Oh dear oh dear. Yes, this volcanic mess is our responsibility. To be fair, we made this a long time ago (before we even got going with Pierate), but the horror still lives on. Luckily we managed to dig this photo of the popcorn pie atrocity out the archives, so you too can gawp at our sheer lack of success. In theory, this pie should have been a rip roaring success. We determined that the temperature at which a popcorn kernel bursts is around 180°C. So we figured that putting the popcorn kernels inside a pie and then heating it full blast in an oven would give us a pie filled with lovely, fluffy popcorn - there seemed no logical reason that this wouldn't happen. Instead, what we removed from the oven was this terrifying bubbling mess. None of the kernels burst, leaving us with a revolting, tooth-breaking disasterpiece. Don't try this at home - it won't work and will be thoroughly inedible. Tempted by the too-good-to-miss pun of a pie-thon, TJP fashioned this pie out of pastry, vegetables and some genuine python meat. He might have only eaten a slither, but that was enough for him to decide he never wanted to eat python again. So those are 12 of the most unusual pies we've eaten so far. Now it's your turn: what's the weirdest pie you've ever eaten? continue reading "Top 12 Most Unusual Pies We've Ever Eaten"
I cannot tell you how nice it was to wake up on Wednesday morning and not have to eat an apple pie! Don’t get me wrong – there’s nothing wrong with apple pie for breakfast (I’ve done it many a time!) but for Day Two of British Pie Week, I had made a #PiePledge to only eat sweet pies for a day. Therefore after 2,580 kcal (just over my daily recommended calorie intake of 2,500 kcal) of nothing but sweet apple pie, my taste buds needed a change! Up stepped the meaty Bison Pie we’d been given from Nice Pie. And quite a whopper it was! Certainly a sharing pie, at £5.50 this is good value for a pie for two and I ate half for my lunch and then the other half for my supper. Good flavour, lovely tender Bison meat and a very good pastry somehow holding all this meaty content in! It was great to see that the pie makers at Nice Pie had improved their pastry recipe to make it less crumbly and more delicious. The pastry tasted a bit more buttery and held together a lot better than the pastry on the previous zebra and squirrel pie I had eaten. It was strong enough to encase the lovely meat but with so much meat inside it was bound to struggle slightly to hold the weight of all the content! All in all, I’d much rather have delicious pastry like this than something that holds the pie together but is so thick and dry as to make the pastry:filling ratio all wrong! Piefection, of course, it perfectly blending the two! The Bison meat tasted lovely and tender, clearly having been slow cooked for a long time to improve the taste. I have to admit to my untrained pallet the meat didn’t have a noticeably different flavour to a good, tender beef steak filling - but that’s not a bad thing as a good beef steak filling is always very enjoyable! After all, it’s a nice meaty flavour. My only slight query is whether I’d consider paying more for Bison meat over a nice beef steak, but I guess that is up to the consumer! The accompaniment to the Bison meat was Old Dalby Pale Ale from Belvoir Brewery, which made a nice gravy which complemented the meat well. This didn’t provide a lot of variety in flavour from the meat and ale, though this isn’t really a problem for a meat loving Pierateer! 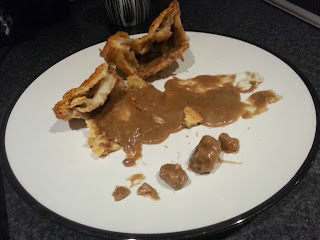 Having eaten hundreds of pies I feel I have had nicer ale gravy before, and preferred the steak in red wine gravy pie I reviewed from Nice Pie, however it was still a very nice flavour. 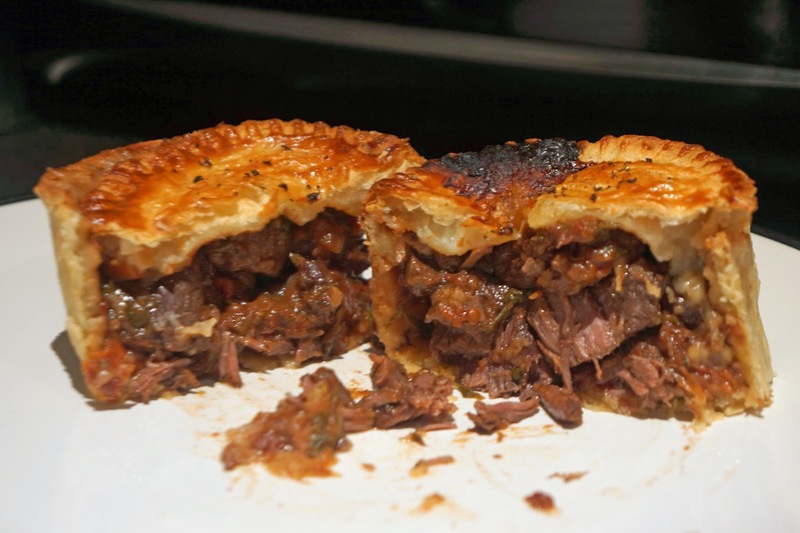 With so much delicious meat I would certainly recommend this pie, though my main concern for the poor old bison is that it may not be “quirky” enough for the pie purchaser that was looking for a very unusual pie flavour to wow the dinner guests with. In that case, I would recommend checking out the rest of the Nice Pie exotic pie range, such as the zebra pie, squirrel pie, wild boar pork pie, kangaroo pie or crocodile pie. 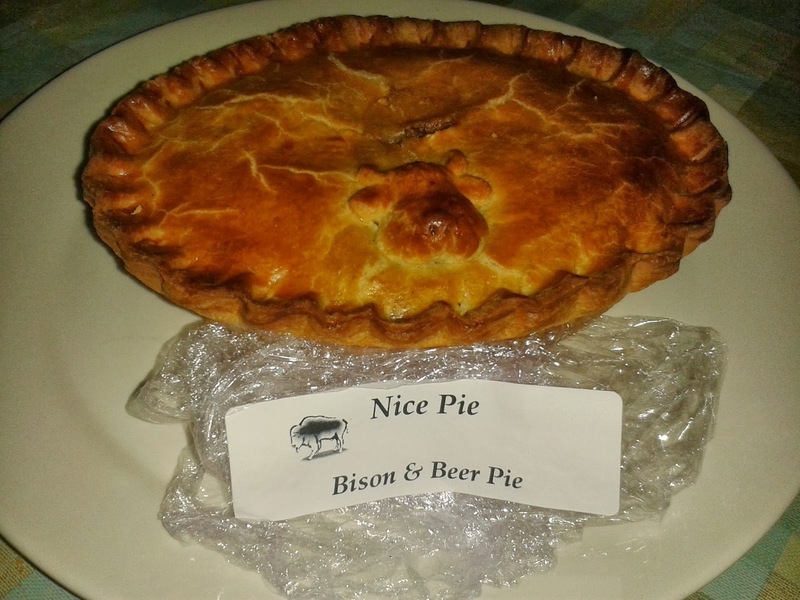 continue reading "A bit(ter) Nice Bison Pie"
I had the same pie again in the 2014/15 season and it was very much to the same standard. If anything, I feel I may have been a bit harsh on it, the filling is quite tasty. I was glad to see that the curry pie mark on the wall was still there a year later! Come on Southend, do you never clean Roots Hall?! I love a trip to Roots Hall, the home of Southend United because it means a trip to Southend. The Pierateers are known to be lovers of the crazy golf on the seafront. The recent match between Southend and Wycombe saw all the original Pierateers attend the match. We were all sat in the away end which has an indoor food counter selling Pukka pies near the entrance. It is nice that the food outlet is indoors but do bear in mind that this isn't a new stadium. Southend have been planning to move for sometime and it is a little run down, but old stadiums do at least have a bit of character. Roots Hall certainly does. 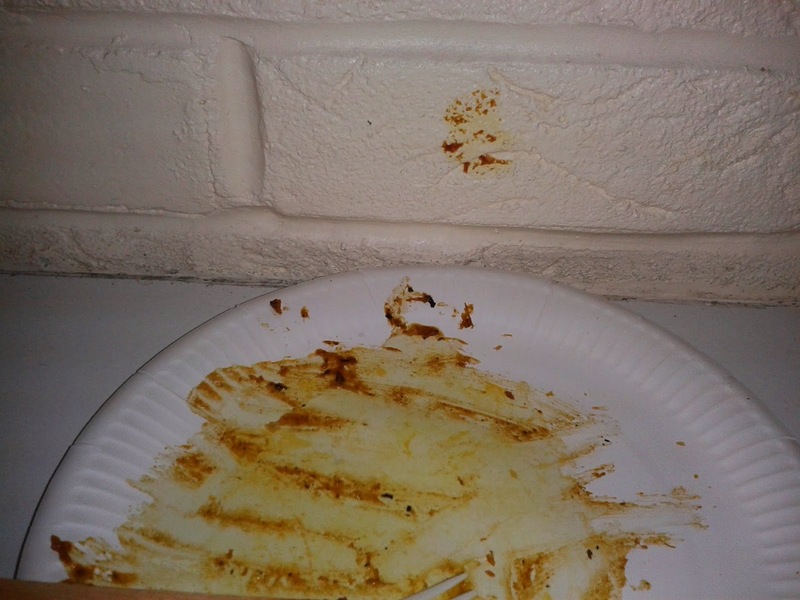 Something interesting that we noted was that there was a mark on a nearby wall which looked exactly the same as the filling of the curry pie I had ordered! Does this indicate an angry fan had been throwing pies around? So upon going to the counter I was pleased to encounter a good range of Pukka pies. Many of these we have reviewed previously in other places however the Chicken Balti stood out to me as one which had yet to be reviewed. It arrived warm in a plastic wrapper. This plastic wrapper option is fairly common at a football ground, I think because they have to heat up lots of pies at once it allows them to do some in advance and helps keep them warm. It seems like they heat the pies inside the wrapper and I am always amazed at how it doesn't melt. Actually I say that but this one did melt onto the metal foil case a little. 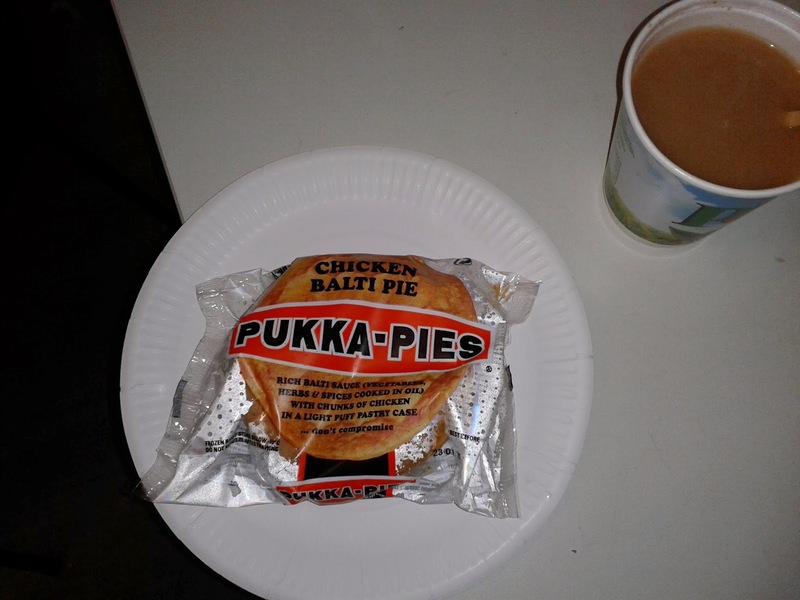 It got me wondering whether this Pukka pie was the same as an unwrapped Pukka pie. This variety do often seem to arrive dried out, but this may be more down to the nature of keeping them warm for some time. 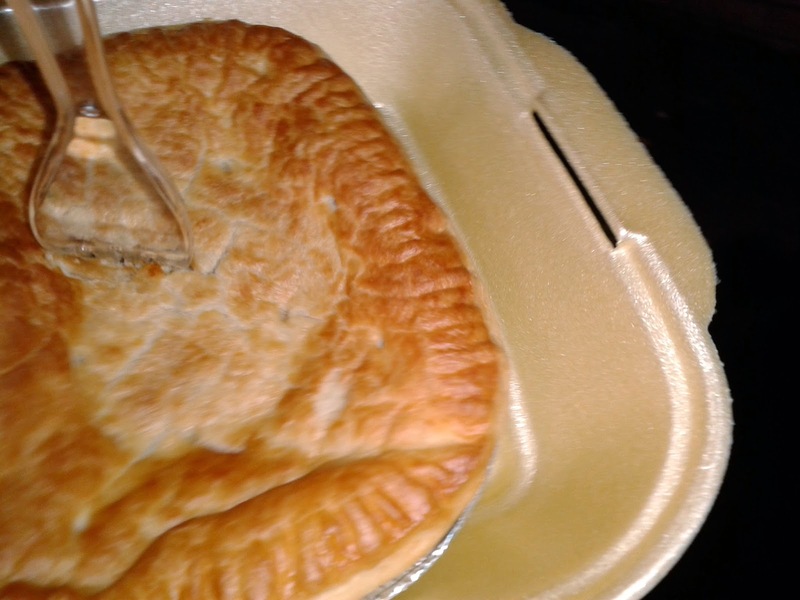 Condition - 5.0/7 - The pie arrived in good condition with a little curry sauce having oozed out the sides. Colour - 3.0/7 - The colour was good in that it was nice and brown but it was too matt effect and not enough gloss effect indicating a potential dry pastry problem. This didn't appeal to me. There was a little bit of yellow curry sauce on the outside which had oozed out. Cheapness - 4.0/7 - At £2.70 this was a pretty standard price for League Two. Capacity - 5.4/7 - This pie was quite tall which gave for a decent Capacity. 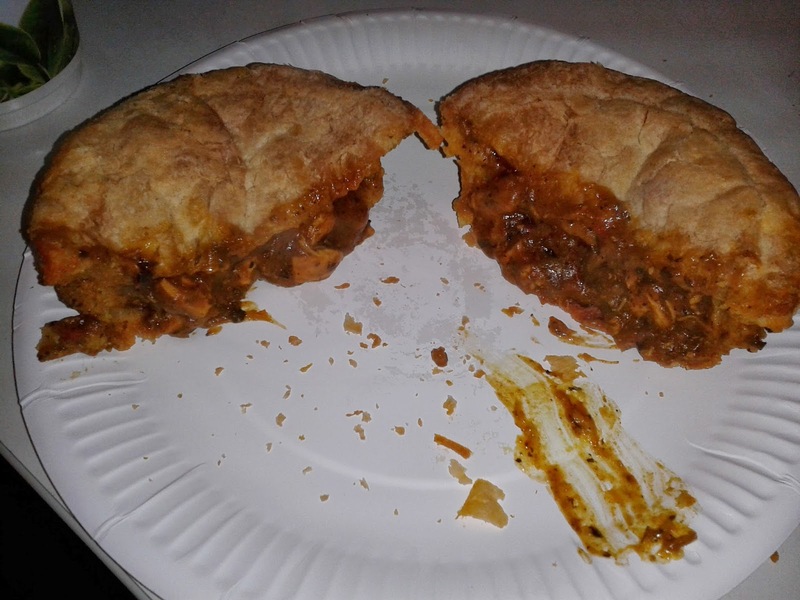 Content - 5.5/7 - I enjoyed the content of this pie, it was quite spicy, which I liked, often football curry pies lack a bit of a kick. It didn't taste of generic curry sauce but what I expect Balti to taste like. However, the meat content was a bit lacking and there were only small pieces. Chewiness - 4.0/7 - There wasn't any chewiness of the filling as it was mainly mushy. The pastry was really quite dry and was flaky rather than chewy. There wasn't really much to get your teeth into with this pie and it did miss the optimum texture. Consistency - 4.0/7 - As an overall package, this pie just about worked. The high liquid content of the filling made up for the dryness of the pastry but it was all a bit too mushy with no bite to either the filling or the pastry. A decent performance by the Southend pie but not enough to challenge at the top of our Football Pie League. The fact that this pie arrived wrapped and was also so dry encouraged me to do a little research, is a Pukka pie always the same or do they sell variations of the same pie. Looking at their website it seems that there is quite an array of options for buying Pukka pies for catering. You can get them pre-baked, unbaked, frozen, unfrozen, wrapped or unwrapped. With all these different options, in addition to the cooking options, no wonder there is such a variety in Pukka performance from one football ground to another. The match itself was dominated by Southend up until they scored in the 63rd minute. After this Wycombe seemed to wake up a little and stopped just aimlessly hitting long balls. The Wycombe equaliser was gained in comical style after a strong strike from Paris Cowan-Hall ricocheted off the cross-bar, hit the back of the Southend keeper and then slowly trickled over the line. 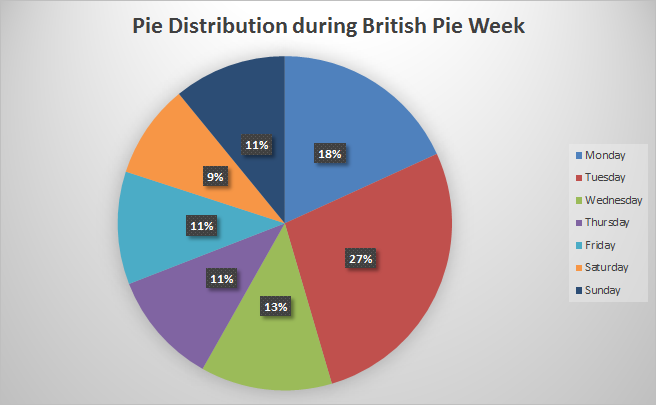 continue reading "Stick a Pie in Your Mouth End at Southend"
So British Pie Week 2014 has come and gone and the Pierateers have eaten… 55 pies!!! Here are the pies in all their glory along with some pie charts to show off all the pies eaten! Plenty of Pork pie on Day One as Pierateer TJP ate just pork pie for the day (three huge pork/boar pies) - not forgetting TJP also had 10 samples of pork pies at the Princess Victoria Pork Pie Off (not counted in our total of 55 due to just being samples). 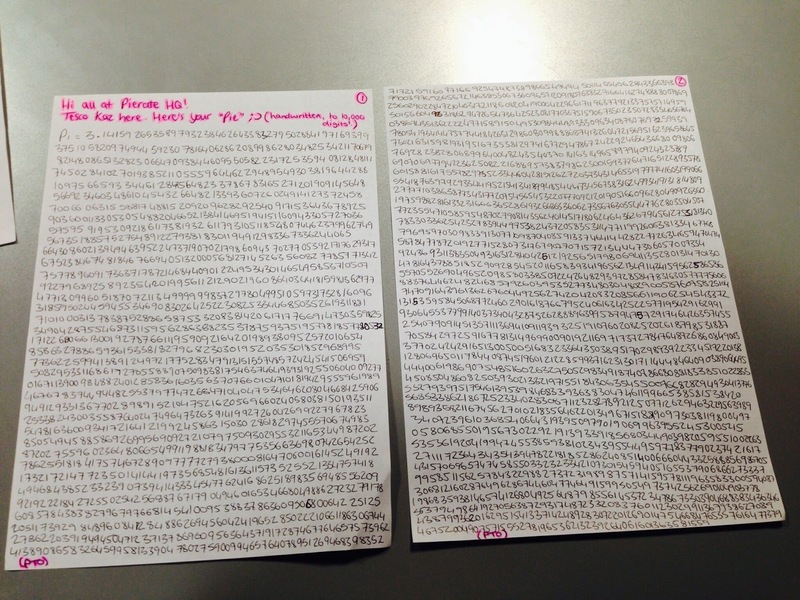 Pierateers RAS, SJL and TJP all completed Pie-thagoras Theorem of having pie for Breakfast, Lunch and Dinner! 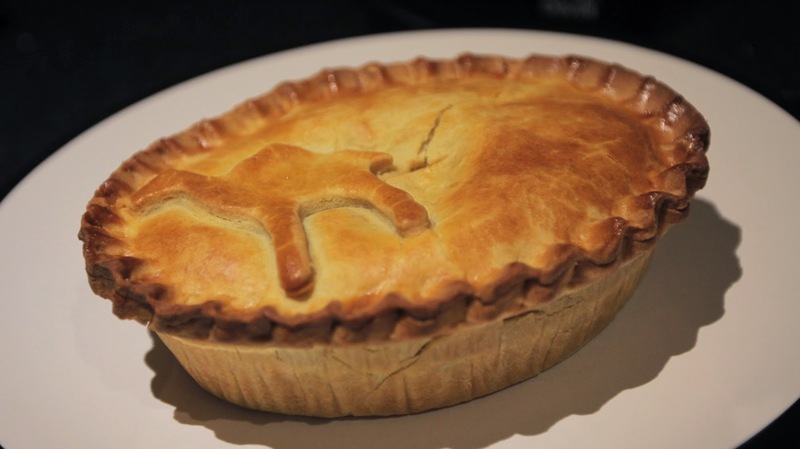 Crocodile pie was also snapped up on the first day of British Pie Week! 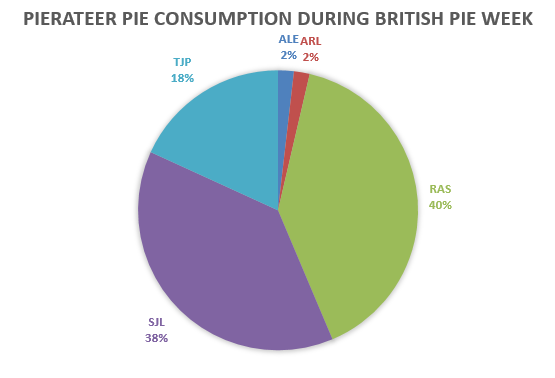 The sweet pie quickly took over from pork pies as Pierateer RAS ate 11 apple pies as part of his #onlysweetpiesallowed challenge, heavily biasing the Tuesday towards apple pies and providing a big boost to the pie count. Wednesday was the day that the meat really got exotic! Not only did we consume a bison pie and camel pie from Nice Pie, but Pierateer TJP made and ate a slither of Python pie! Unfortunately it didn't turn out to be the delicacy he hoped, but you can find out how to not make a Python pie here. Thursday saw the first vegetarian pie of the week consumed (excluding fruit pies) with a steady number of steak pies being eaten. For Friday, Tim went a bit crazy with the pastry again, following up his python pie with a slightly more traditional but still quirky ice cream pie! It was also great to see our Pierateer Abroad - ARL - find and consume a Tuna pie in Spain. Our first Spanish pie! Pierateer SJL ate out at the Farmers Boy Inn. The quietest day on the pie front and you can tell the arteries were slightly clogging up with pie by this point! More steak and beef pies got us through the day, including a Tom’s Pie out in Bristol. 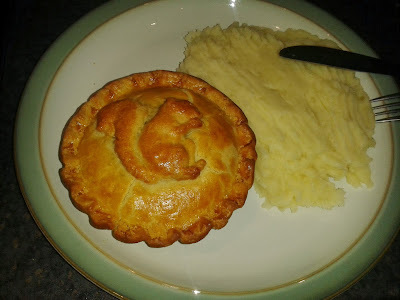 Added to the excitement of reaching 1,000 followers on Twitter, Sunday saw the Pierateers consume their final pies of British Pie Week and our Gluten Free Pierateer ALE get involved with a homemade Sausage pie for her and Pierateer SJL! We also dissected a Linda McCartney soya protein pie. And that still doesn't include the Ship's Cook making a Scotch Pie too! It's been a great adventure once again and so many pie-lights in the week! 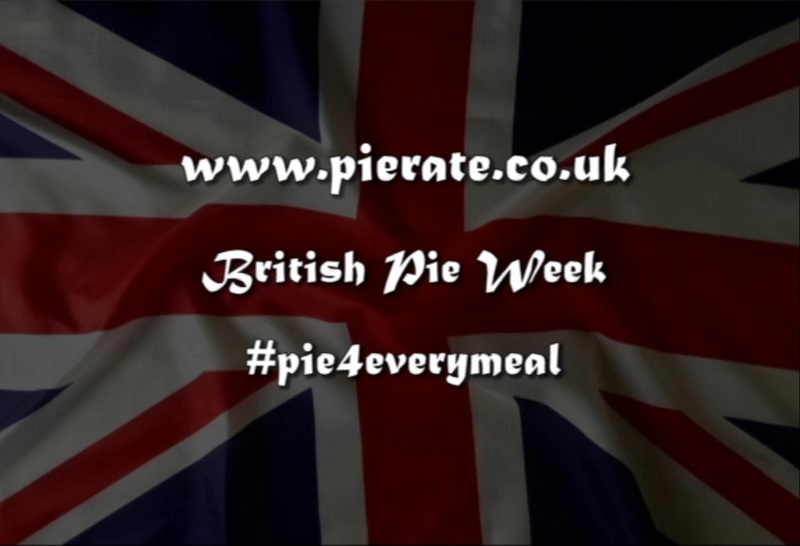 You can catch up on all of the #Pie4EveryMeal videos from Pierateer SJL's #PiePledge and see many more pie reviews via our daily diary and we can't wait to get our teeth into more pies this year! Remember, a pie is for life, not just for British Pie Week! 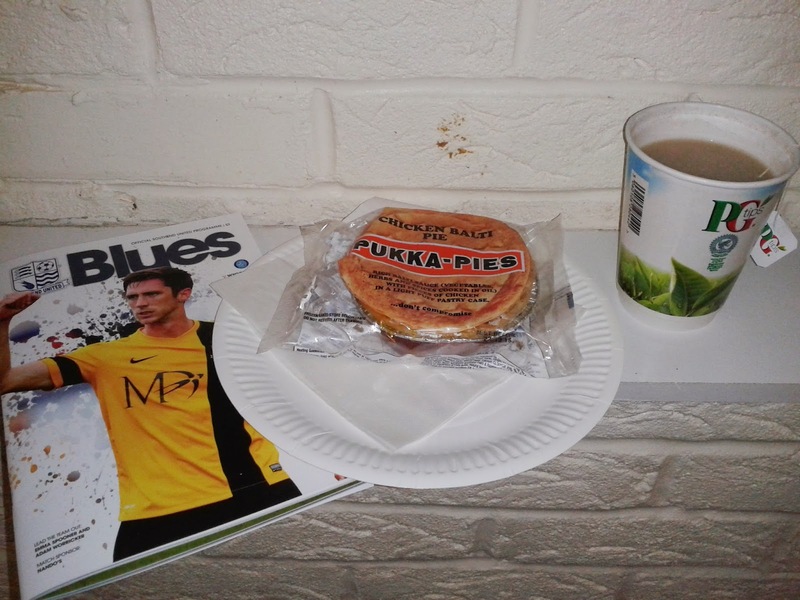 continue reading "55 Pies for British Pie Week"
Last night I went to Whaddon Road to see Cheltenham Town take on Wycombe Wanderers. I had heard that the pies sold at the back of the stand behind the goal advertised themselves as 'homemade' so I thought I had better check them out. My source had questioned whether they were indeed homemade but still thought they weren't too shabby. The pies are sold from what looks like a portable burger van type affair which is just placed on the concrete behind the stand. However, it did look fairly appealing. The menu was painted onto the side of the unit and it did quite clearly say that the pies were homemade. In fact it advertised that they were not just homemade but read 'GOURMET HOMEMADE PIES - £3'. Needless to say, to a Pierateer this was pretty exciting. Upon receiving the information that the available options were Chicken & Mushroom or Steak I decided that I had best give them the best chance of topping our Football Pie League by opting for the steak because it is my favoured pie choice. Once I gave my £3 I was baffled to be given 50p change. They said the pies were cheaper today.... I soon found out why. The pie I received was clearly not homemade. It had a classic mass produced oval shape. There were perfectly crimped edges and a pattern of lines on the top only found with pies from a factory. The pie was also very shallow with a small Capacity. I was very disappointed with the appearance. 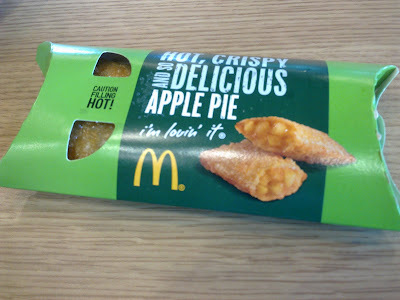 I tried to reserve judgement until I had tasted what was sure to be a flavoursome pastry package. The first bite was one of the most strangest first bites I have ever had with a pie. This clearly had been made with some flaky puff pastry, however it had puffed up and dried out so much that it just fell apart into almost nothing. To me it tasted as if I was eating a fried Ryvita (and not in a good way). I think this was partly due to the pie having dried out in the hot counter, despite the fact that I had opted to get my pie in before the match. There was also far too much pastry, the first bite was just flakes of pastry and air. This was contributed to by the lack of filling in this pie. There were a couple of small pieces of meat, although these didn't particular look like beef, with the one shown in the picture striking me as particularly pink. Strangely, for a cheap pie, they didn't even bother to pack it with gravy to make up for the lack of meat. There was a bit, but not enough to moisten the dry pastry. It did taste of steak in a generic way and at least it didn't taste bad. So, with being completely dis-satisfied by the pie I decided to go back to the food outlet and enquire who made them! The first thing I was told was that the pie was 100% horse meat. This was said as if it was a joke but it was a bit worrying after the meat in the pie did look so strange. The guy in charge said that these were a substitute pie, their normal option being unavailable for tonight. This seemed to explain it, so who made the gourmet homemade pies that they normally sell? The guy proudly informed me that they normally sell delicious Pukka Pies. Right... I don't have anything against a Pukka (and it would have been A LOT better) but they aren't exactly homemade! Once the guy in charge found out I was writing a review he asked me not to write it because they weren't the normal pies they sell. I told him that the pie on sale today was probably the worst football pie I had ever eaten. Apparently this was 'ok' because they were 50p cheaper! At £2.50 this wasn't even particularly cheap for a pie at a League Two ground. After that I went on to enjoy a fairly decent game. Both teams were battling for possesion and sometimes it lacked fluidity but at least there were some goals. Wycombe had a couple of great chances but ultimately Cheltenham went ahead after a header in from a cross. Wycombe equalised from the penalty spot so the game finished 1-1. The point will be valuable for Wycombe to ease their relegation worries. However, Cheltenham have relegation worries of their own as their substitute pie falls well short of the standards expected. This leaves them bottom of our Football Pie League. It may have been a substitute pie, but I can only review what I am served. There was no mention of it being an alternative before I brought it. However do bear in mind that you will probably be served a Pukka pie at Cheltenham, but the poor level of service will be the same. There is always a chance you may be served one of these abysmal pies, perhaps check before you buy, you have been warned! 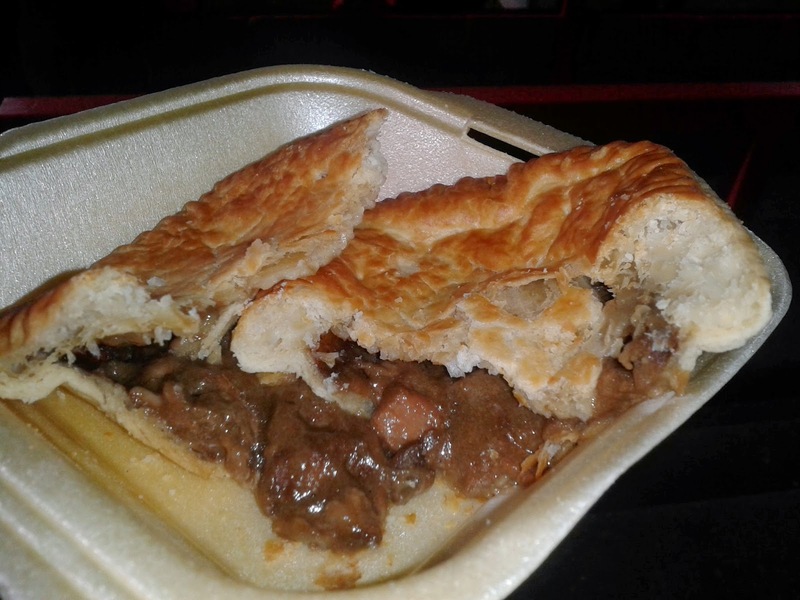 continue reading "Cheltenham Town Relegation Material"
As mentioned on Day Five of British Pie Week, the day started well with a pie package supplied by “The Ark” catering company in Burnley. The owner Jonny has taken over a sandwich shop and is looking to diversiPIE… well, who wouldn’t want to add pie to the menu?! Selling at markets and doing outside catering events, the pies are a new venture but would they sink or swim when rated on the Pierate Ship? 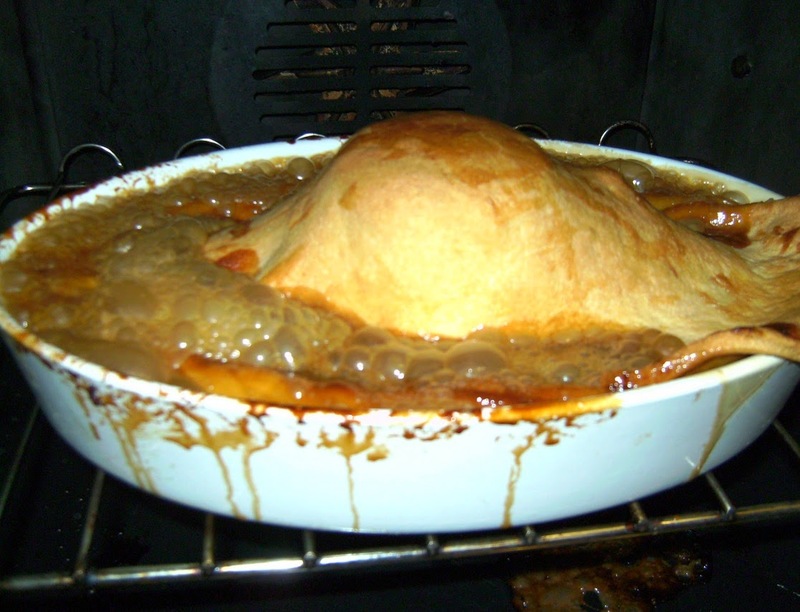 Well the Steak and Ale was – you’ll be pleased to know – fully encased in pastry. The pastry held together well (you could pick up this pie and eat in your fingers) and the meat was very good. It was a very good effort for someone relatively new to pie catering! He’s certainly pushed the boat out… or should I say ark?!... and it’s paying dividends! The meat was lovely and tender. The pie had reasonably strong capacity and you could tell the meat is sourced from a local butcher and cooked well to be so nice and tender. The meat combines well with the ale gravy which was very tasty. To reach pie-fection I would have preferred a slightly bigger pie, as I feel it was a little shallow and could have been packed out with a bit more meat. But I certainly wouldn’t be put off buying this pie as it is, as the content was very good and the pastry:filling ratio wasn’t far off being ideal. The pastry itself was quite nice and crisp, holding together well and balancing the flavour well with the steak and ale. The top crust colour was a bit varied and tasted a little dry for me, in particular the edges of the pie lid, but overall the pastry was good and had a good bite to it. A slightly smoother, more buttery pastry lid would probably have improved it slightly and might have evened out the colour. But again, these are small changes needed to take this pie from Pierate Recommended to Pierate Highly Recommended status. Being sold at £2.75 from local producers markets, these are quite reasonably priced pies. I would say I’ve eaten slightly bigger, more meat packed pies for the £3-4 mark, but this still a good meaty pie for that price so doesn’t score badly on cheapness. I’m sure I could write a flood more pie puns but that might be too (by too) much at this point. Wood-n’t want you getting me to walk the plank for bad punnery! But to summarise, it’s not plain sailing on the pie making front, but Jonny at The Ark Caterers can safely sail the seven Cs of pie rating with a top quality pie which, with a few minor tweaks, could see him even beat his Pierate Recommended status! 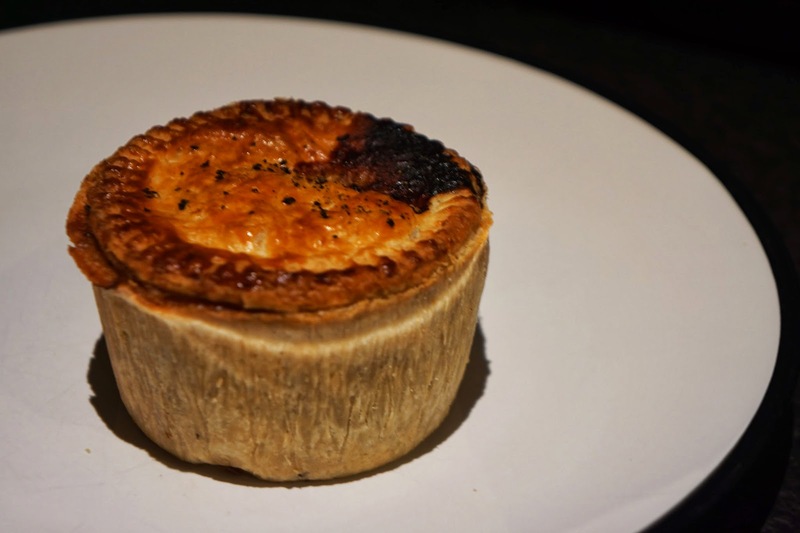 continue reading "Will The Ark Steak Pie float my boat?" My preconceptions about camel were that it was going to be quite a tough meat. Not that I'd ever tried it, of course, but one just assumes these things. An animal of the desert must be tough as nails, right? Indeed, the random man sat next to me earlier in the day commented how he thought my camel pie was going to be chewy. "I've had camel before," he announced. "It was difficult to cook, and ended up tough." But I had faith in that lot at Nice Pie. They certainly hadn't let us down with previous pies. We've tried zebra pie, squirrel pie, wild boar pork pie, bison pie, crocodile pie, steak pie and chicken pie, and they were all delicious. So Nice Pie were bound to come up with something super special. Coming out of the oven, you can see the pie has taken on a lovely golden brown colour. I am also a big fan of the camel stencil on the pastry, and love how there's no scrimping with the crimping round the edge - this pie is in great condition. Opening up the pie, the pastry is nearly packed to capacity - although you can see a definite air gap there. The pie is scoring well so far, but as I work my way through rating the Seven Cs it's obvious that the most important C in this case is chewiness. Will the camel meat be tough? Do Nice Pie need to go back(trian) to the drawing board? Here's the moment of truth. I put a good chunk of the camel meat in my mouth and...it's delicious and tender, and not at all chewy. Great! I gather the secret is that Nice Pie slow cook the meat, making it nice and tender. It's mixed in with some carrot and gravy, making for a very tasty content. All in all, I certainly haven't got the hump over this camel pie - far from it! From now on I'll be a big advocate of camel meat, which is a prized meat across the Middle East. 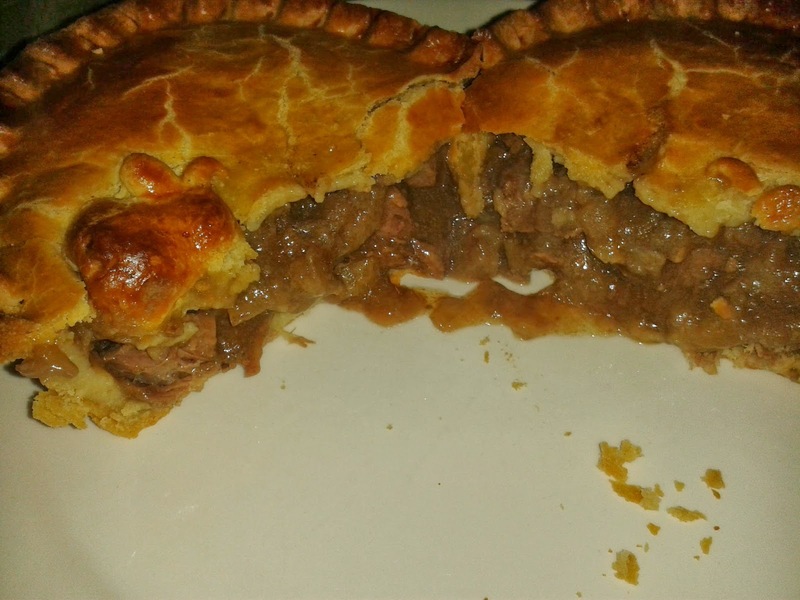 At £5.50 for a large pie that contains an exotic meat that's considered a delicacy in some parts of the world, this pie is priced very attractively. And just because we love it so much, check out the Pierate pie that Nice Pie made for us! continue reading "Out of the desert and onto my plate: Camel Pie"
It was a cold, rainy day. As I walked home across Gloucester my hands were starting to go numb. I still had quite a walk before I would get home and so I looked around desperately for somewhere I might be able to warm up. I could see a chip shop ahead and so I dashed inside, not so much out of desire for fried potato but more out of a desire to be inside for a few moments and gather enough strength for the rest of my journey. The friendly glow from the hot counter instantly made me feel better. Not just because it was actually giving out plenty of warmth but also because I could see some hot pies behind it. Initially this didn't seem to be too much of an unreasonable comment but after a while it got me thinking. Was it really pies that made this guy as fat as he was? Certainly he didn't seem to have solved his problems by switching to chips, sausage AND cod. Was my single pie treat for the day really going to have much impact on my health? How did our society come to blame pies so heavily for our obesity problem? It was then I decided on the challenge I would undertake for British Pie Week. 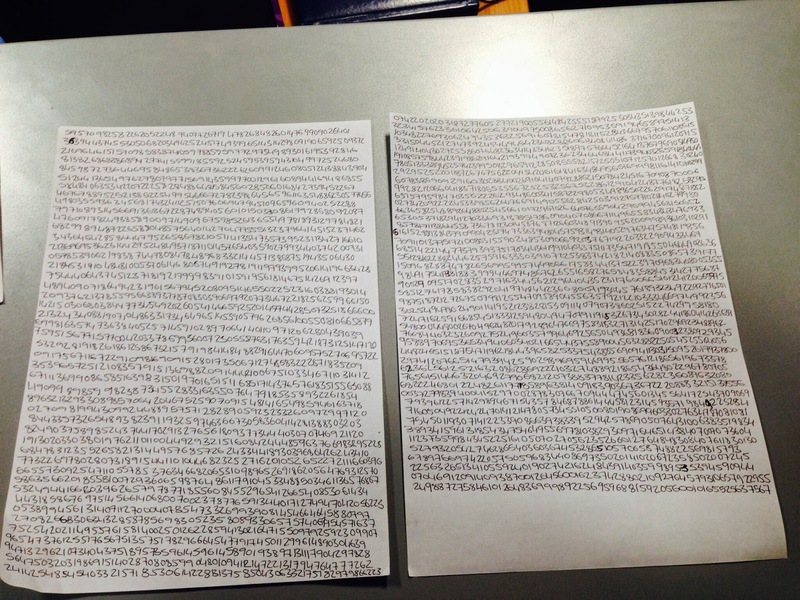 I needed some way to find out what effect eating a lot of pies would have on my health. This why I annouced my #PiePledge for British Pie Week would be to eat pie for every meal, giving a total of 21 pie meals in one week. The generally accepted wisdom is that this kind of diet would leave me with more than just weight on my mind, I should end up physically weighing more than I did at the start of the challenge. Many might also expect other noticable effects, such as digestive issues or a loss of energy. In order to make this a fair test I needed to isolate the effect of the pies. To do this the rest of the food I ate was mainly healthy and I made sure I ate at least my 5-a-day of fruit and veg. I also completely cut out snacks between meals. However, I by no means only ate small pies, I made sure I always ate at least a medium sized pie, with some being over 1000 calories. I realise now that I do snack quite a lot and I think this is much more of a contributor to my body weight than pies. It was actually quite hard to give these things up and made me realise how many calories I consume in chocolate, biscuits, crisps etc. Despite containing many calories these things don't really stop you feeling hungry. At least with a pie there is a sense of fulfilment as it can be a whole meal in it's own right. I felt quite satisfied just eating my three round meals a day. I also did a moderate amount of exercise, although only a similar amount to what I would normally do. But how did I feel during the challenge? I know it might be hard to believe, but genuinely I felt better than normal. I did have one bout of stomach acid issues, but this is actually less than normal for me! I occasionally longed to eat pizza or muesli but most of the pie meals really were satisfying and I didn't crave snacks all that much. *Please note, I did on occasion significantly exceed my Guideline Daily Amounts of saturated fat and salt, although most days I was quite close to the GDA figures. See below for my video diary from each day. There is also a separate review which can be found by clicking on each pie listed, in total 18 new pies were reviewed. The #pie4everymeal challenge completed 7 consecutive days of Pie-thagoras Theorem but it was by no means the only challenge to do this during British Pie Week. 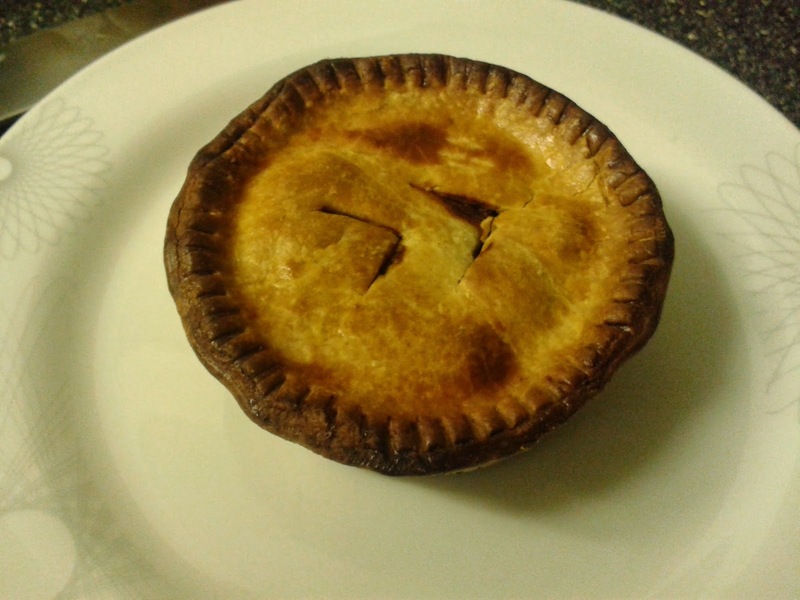 We also completed a range of other #PiePledges, see our summary of British Pie Week for what we got up to here at Pierate, the unofficial home of British Pie Week. Pierate is a pie review website searching for the ultimate pie. For all the pies we have reviewed have a look at our Pie Rankings or find pies of a particular flavour under Pies: Categorised. continue reading "Pies Don't Make You Fat! I Ate Pie for EVERY Meal for a Week and Lost Weight"
Well it would be rude not to eat a pie on Pi Day, wouldn’t it! The date is 3.14 after all! So, with the Pierateers delighted to get the support of Tesco to rate some more pies, it was time to give them another rating! 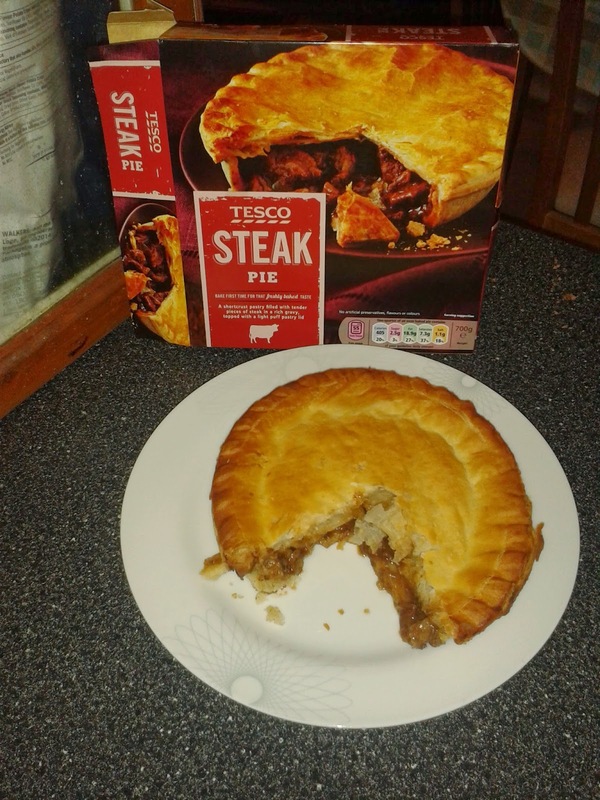 They supplied a £15 pie voucher to spend over the coming few weeks - with plenty of Tesco pies already reviewed - so the pie eaten today for Pi Day was the family sized Tesco Steak Pie. 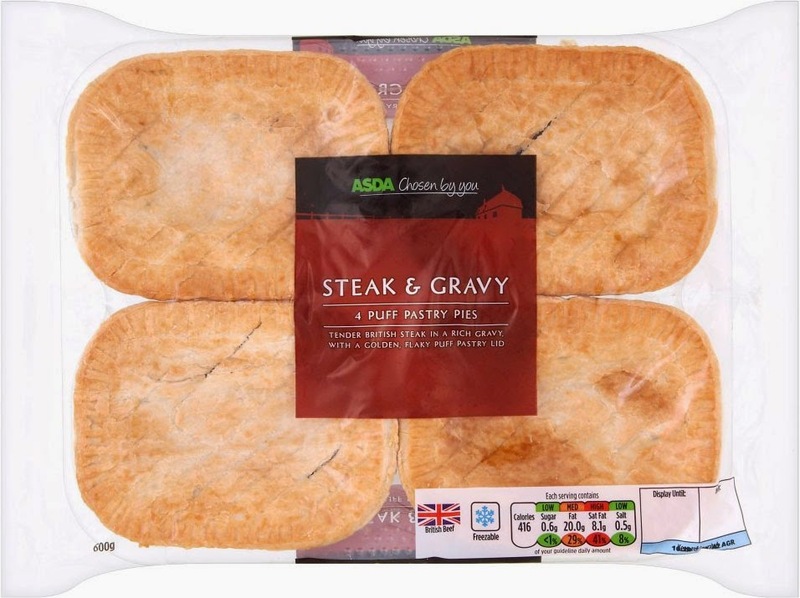 The Tesco Steak Pie cost £3.00 for a family sized pie and are marketed as being shortcrust pastry filled with tender pieces of steak in a rich gravy, topped with a light puff pastry lid. This pie is cooked from frozen, so it does take almost an hour to cook, but was it worth the wait? Well the lid of the pie was quite nice and crisp, with the puff pastry lid being very nice. The side and base pastry was a bit thicker and some parts were more crisp that others. The pie did unfortunately fall apart slightly as I lifted it out of the foil tray but this was primarily due to there being quite a lot of content in the pie. It may not have been quite filled to the rafters with meat as a lot of the handmade pies we’ve eaten lately are, but the meat was quite nice and tender. A few chewier pieces were there too, but this was one of the more impressive supermarket pies for meat quality (especially as it wasn’t a “finest” range pie). At £3.00 for a family sized pie, this seemed quite good value. There was plenty of meat inside, although a fair bit of onion bulking out the gravy too. The gravy was nice, not too rich but flavoursome. All in all, a mass produced frozen pie is always going to struggle a bit against fresh, handmade pies, but this was a good pie to go for if looking for a nice, affordable frozen supermarket pie. It earns "Pierate Recommended" status. 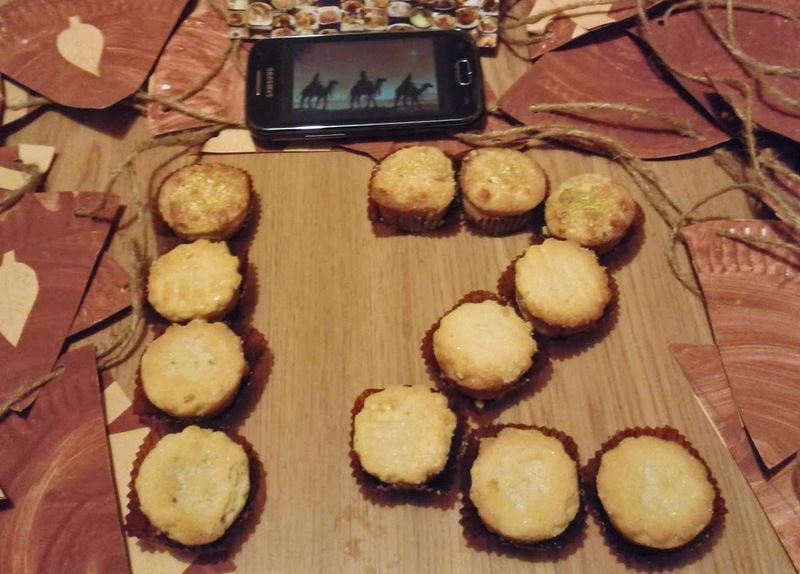 continue reading "Steaking out on Tesco pies for Pi Day 2014"
continue reading "Pi Day 2014"